The Splash Pad is now CLOSED for the Fall/Winter season and will reopen April 2019. Come cool off at the Old Town Winchester Splash Pad located on the south end of the Loudoun Street Mall. Summer is finally here and the temperatures outside are rising. 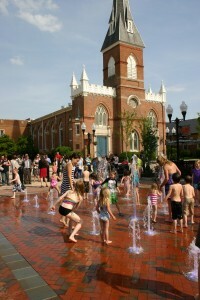 This is a great time to visit the Splash Pad on the Loudoun Street Mall in Old Town Winchester. Bring the kids down to play in the water as over 20 spray heads dance up and down at multiple levels each minute. After dark, watch as the water is illuminated in Red, White and Blue. Please leave the fun to kids. Pets are prohibited. The City’s Splash Pad has electronic VFD’s (Variable Frequency Drive) units connected to each of the three main pumps. Each pump controls a section (3 total sections. Outer, middle and center) of spray heads. The VFD’s are programmed to make the pump speed up and slow down at specific intervals thus causing the water coming out of the spray heads to dance or spray at high and low levels throughout the program. The outer ring shuts down completely for a second at the end of its VFD cycle.